Record a bird singing and tap 'Id' to identify it. This web page is a copy of the Birding Via Mic Help screen with screen prints added to help illustrate the functionality. Following this Help section there is a Detail section where Filtering, Recording, and Editing are expanded. 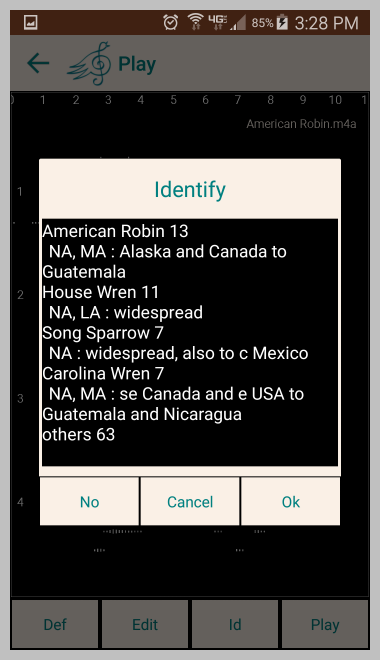 Birding Via Mic is an android app that identifies birds by their songs. Technically it doesn't differentiate between songs and calls. You can record a bird singing, play the song back, edit the recording, and (hopefully) identify the bird. You can download songs and I give you a few sites that are available. This is not a structured bird song collection. I hope it will become a collection of world class birder's favorite songs. 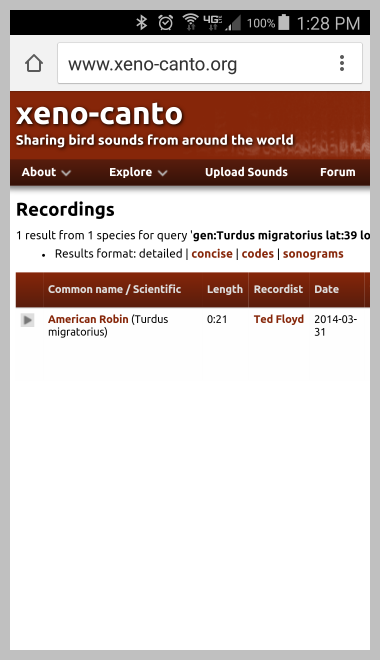 It is a tool that can help you build a bird song collection and help you identify birds. 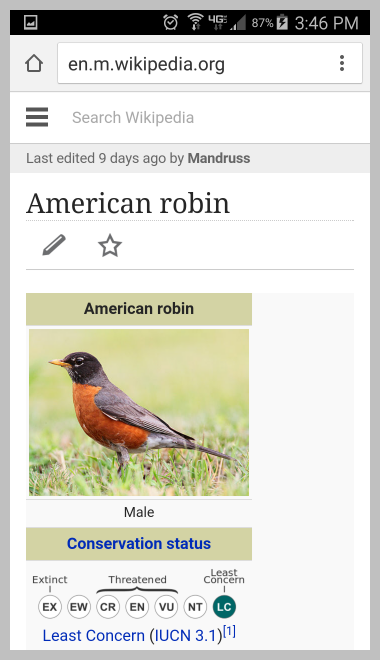 By downloading, and defining the birds the app will be able to recognize many of the birds that you record. Please follow the American Birding Association code of ethics, by not playing back your songs where the birds can hear them. The songs fall under the Creative Commons licenses and allow users to download and distribute recordings under certain conditions specified by the license. There are NO songs in this app. ZERO. You have to load them from another app. There are currently four other apps that are associated with this app: Birding Via Mic New World, ... Old World, ... Orient Australasia, and ... North American Common. These apps contain songs for their respective region (called YourRegion below) but no functionality other than supply this app with the songs they contain. You will need to install one (or more if desired) of these and transfer the songs to this app. 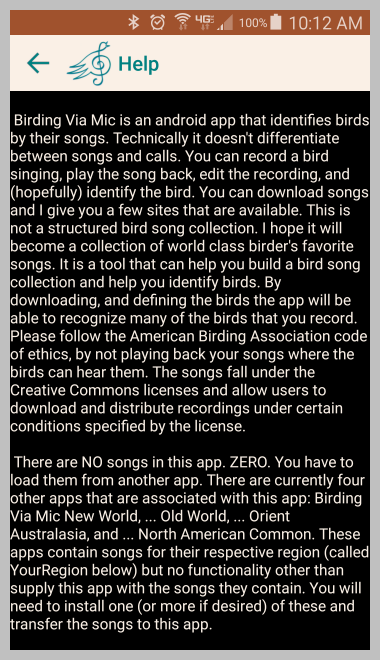 1) Install this Birding Via Mic app. 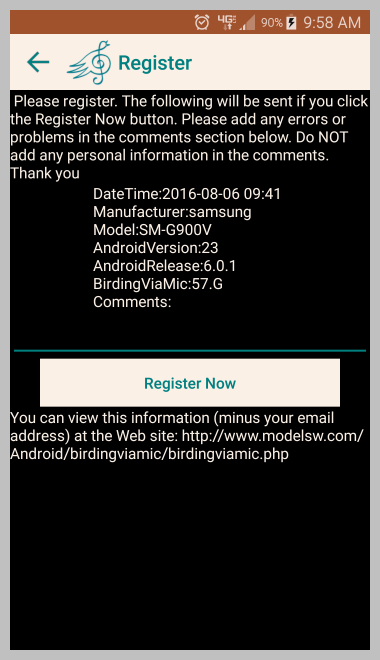 2) Install Birding Via Mic_YourRegion app. 3) Open Birding Via Mic_YourRegion, tap Songs and verify a list of songs is displayed. 4) In this Birding Via Mic app tap the Path button. 5) On the Path screen select Birding Via Mic -- YourRegion. 6) Tap the "Load Now" button. Uninstall the Birding Via Mic_YourRegion app to recover memory. If you are missing some files check and Update Region, RedList, and set Option > Use Location false. They should be loaded but could be hidden. Additional sources and methods of acquiring songs are discussed in 'Path', 'Web' below. See also 'Identifying Birds' on the Birding Via Mic web page for selecting and identifying the common birds in your area. The following list is a summary of the 'Home' (main) screen. You can get more detail following this summary. The 'Songs' button brings up a Songs screen that lists the recordings you have made or downloaded with options to 'Select', 'Delete', 'Name', or 'Play' the files. 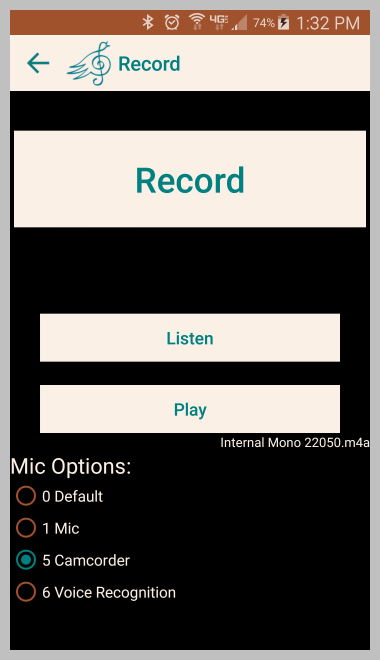 The 'Record' button brings up a 'Record' screen where you can 'Record', or 'Listen' to the current recording. The 'Play' screen has 4 options. 'Def' (Define), 'Edit', 'Id' (Identify), and 'Play'. The 'Species' screen lists the Common name, Genus Species, and Locations with options to 'Delete', 'Name' (Rename), or 'Add' your own. The 'Web' button will bring up a web page of the bird last selected or identified or requested. The 'Options' screen provides some customization of the app. 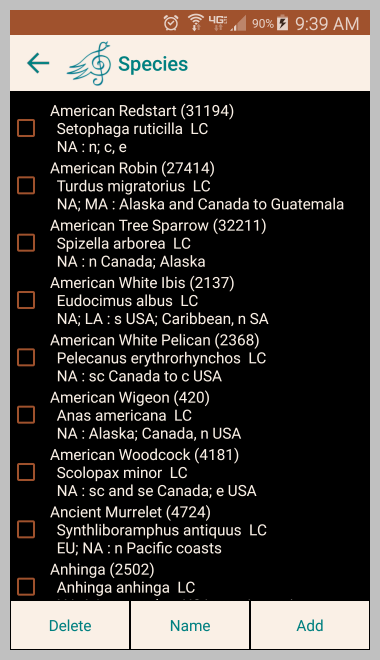 The 'Red List' screen limits the World Bird List to species listed within particular IUCN Red List categories, such as Least Concern (LC), Near Threatened (NT), etc. 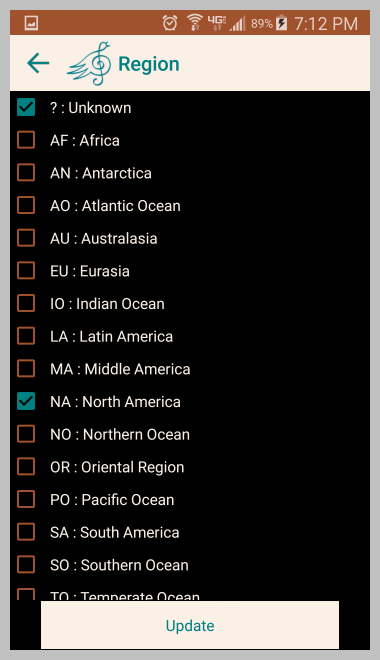 The 'Region' screen limits the World Bird List to Regions such as 'North America', 'Eurasia', et al. When 'Location' is enabled (See 'Options'), this shows your current location (within one degree) which should be enough to identify a general location within 110 km (70 miles). The concept is: if you are in Canada you wouldn't expect any Caribbean birds and they will be excluded from the list of songs, and species, and excluded in identification. In addition, I show a descriptive location of the bird and let you decide if the selection is valid. The 'Path' screen allows you to load songs from other sources. 'My List' contains your personal list of species that have been identified and defined. The 'Register' button brings up a Register screen. The 'Songs' list has a check box for selecting the file, the file name, followed by nine markers. A dot (.) is shown if the marker is not true. For example xm0caesi. states: external mic, mono, at 22050, as camcorder, auto filtered, enhanced, smoothing, identified, not defined. 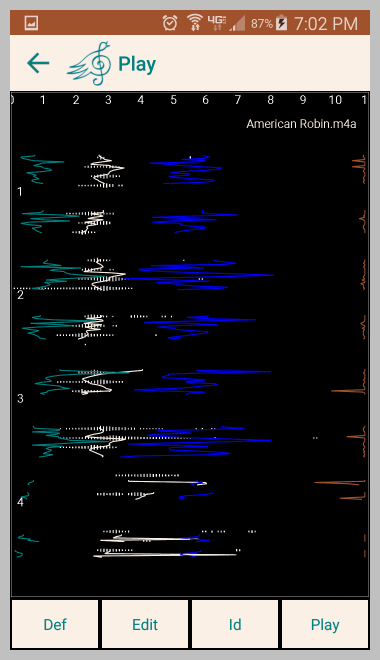 The next line shows the species followed by the _i.s RL where i is the index (song number for that bird) and s shows that a segment or portion of the song, not the full song, has been used, and RL is the IUCN Red List Category. For example _2.0 LC is the second full song of this species and has a Least Concern designation. The last line shows the location where you would expect to find the bird. You can 'Select', 'Delete', 'Name', or 'Play' the files. You can select several songs and tap play. Each time Play is tapped on the 'Play' screen the next song will be played. You can select one song and tap 'Name'. That brings up a dialog box where you can change the file name, or select the species. If you load a file from an external source and make the file name the common name of the bird (plus a number if necessary to make the file unique), I will look up the species when I see the new file. You have the option to sort by file name or species. Don't define a song if you are not sure of the identification. You will contaminate the definition file. Delete gives you the option to 1) delete 'File and Definition' if it is a poor recording and doesn't help in identification or identifies a bird that you know is wrong; 2) 'Definition Only' if you have a good song you want to keep but it was defined wrong; 3) 'No -- Cancel' gets you back to the 'Songs' screen without any changes. If you do define a song that is identified correctly it will help in the identification next time. The menu offers Meta Data or Share for the selected file. The 'Record' button turns to 'Stop Recording'. The 'Listen' button turns to 'Stop Listening'. The 'Play' button sends you to the 'Play' screen. You can choose the format (.m4a or .wav), channels (mono or stereo), and sample rate (22050 or 44100) in the 'Options' screen. The recording is saved as @_ followed by the date with Unknown as the species and location. The Audio Source Mic Options are 0 (.) Default, 1 (m) Mic, 5 (c) Camcorder, 6 (v) Voice Recognition. These are the four options that affect the recording. They are shown in the third marker of the songs name. From the android documentation: 0 Default - unmodified, 1 Mic - enhance close sounds, 5 Camcorder - enhance distance sounds, 6 Voice Recognition - Auto Gain Control turned off. But these are recommendations to the manufacturers. And they work differently on different phones. Use what works best for you. On some phones setAudioSource fails and you need to try a different Mic Option. In this case use what works for you. Tap 'Play' to start the song that was chosen from the 'Songs' screen or sent from the 'Record' screen. I can only read 22050, 24000, 44100, or 48000 wav, mp3, ogg, or m4a stereo or mono files. The song is adjusted to fit on the screen. 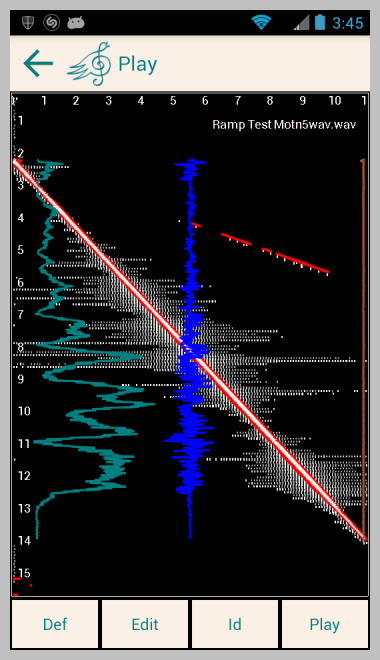 Frequency is across the top and time down the side. If the bird is known and you want to add it to the definitions, tap 'Def' (Define). After being defined, you will notice the bird selected will now have a 'd' (defined) in the ninth marker after the name and will thus be used in identification. You can only Define songs that have been identified or have been assigned a species. Tap 'Id' if you want to identify the song. You can identify songs that have been assigned species or are undefined. Up to four names will show up. Each bird will have a number following the name and a location for that bird. The numbers represent the percent chance that it is the correct bird. If you agree the first bird in the list is correct, tap 'Ok', else tap 'No' or 'Cancel'. If you tap 'OK', the bird in the Song List will change the eighth marker after the name to 'i' (identified), 'No' will change it to '?' (disagreed) and 'Cancel' will leave the marker as is. If it is a Recorded song (saved as @_ and the date), and if you accept the identification it will change the name of the file to the bird's common name followed by a number to make it unique. It may take several songs to define a bird. Try identifying the song before you use it as a definition. If you agree with the identification and if the score is high, don't waste space by defining it and thus adding additional similar information. If the score is low or it identifies the wrong bird and you know the species is the correct name then define it. 'low' and 'high' are relative. They are best compared with numbers before and after you define the song. The definitions are all separated by file so you can define a file and see if the identification improves for that bird with the other files you have or you can delete the definition but keep the song for that file and compare it after you delete the definition. See Songs above for the Delete function. If you have a good recording and you know the bird is identified wrong you can return to the Songs screen, tap 'Name' and select the species from the list and then after playing the song tap 'Define'. You don't need to delete a definition to re-define it. If you get a message 'Decoder failed on FileName', the Definition or Identification will stop and will mark the song with an E (Error) in place of i (Identify) or d (Defined). When it fails, it fails at 91.9 percent completion of the file regardless of the length. It doesn't matter if you are using the Option Load Definitions set true or false, if the song is stereo, or mono, what the sample rate is, or if you are defining, or identifying the file. Once it fails it continues to fail until you restart this app. This is not a common problem. It can run successfully for hundreds of files. But you should expect to get this error eventually. I don't have a fix at this time. Restart this app to restart the file decoder and then define or identify this errant file first. Tap 'Edit' then tap a second time near the center of the screen to start the edit mode. Use 'Edit' if you need to extract a portion of the song to be defined or identified. There are three on-screen commands available when editing a song: 'Exclude', 'Save', and 'Cancel'. Drag the white 'start', 'stop' lines to include what you want saved and tap save. 'Save' uses the same file but saves the start/stop information in a new record with the same file name, same index, and increments the segment by one. 'Save' works on the phones that Visualizer View fails on but Visualizer View still fails even though the save is shorter than 40 seconds. 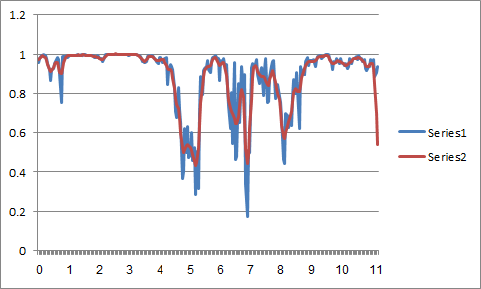 Drag the green Frequency 'low' and 'high' lines, and the red 'begin' and 'end' Filter lines to where you want them. Use the names as the handles to drag the lines and tap 'Exclude'. Use Exclude if you have background noise. 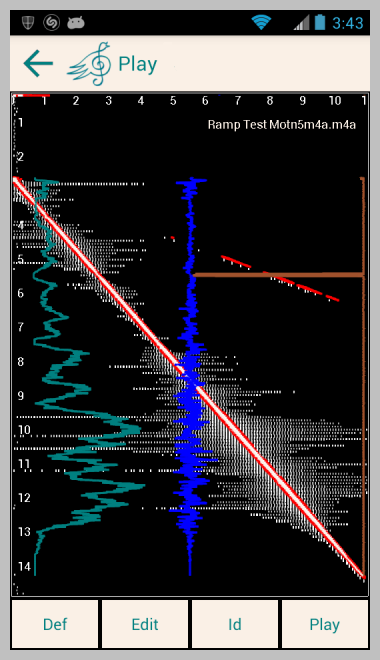 The Filter and Frequency lines do not remove any of the file but rather look at the noise between the Filter lines and outside the frequency lines, and defines those areas as noise in the whole file during define or identify. The use of any Frequency or Filter lines will set the fifth marker after the name to a small f representing filtered. 'Cancel' removes a previous Exclude. Use Delete on the Songs list to remove a previous Save. Recorded with a Motorola Droid Razr. Source from Backyard Bird Song CD Peterson Field Guides. Richard K. Walton/Robert W. Lawson Houghton Mifflin. Played through a Yamaha Powered Monitor speaker. The Species list shows the Common Name, Genus Species, IUCN Red List Category, and Location. You can sort by common name or species. The Genus Species sort includes Order and Family which are not shown. So the sort may look strange. But this sort puts all the ducks together, thrushes together, etc. You can 'Add', change the 'Name', or 'Delete' your own Genus / Species to/from the list. I added two squirrels, a chipmunk, me chirping, and my neighbor's dog. If you have 'Use Location' checked (See Options) I will save your 'Local' location, else I will save 'Unknown' for the location. You can NOT modify the bird species, names or locations. You can limit the Species List. A few sub-species are included. The list is derived from http://www.worldbirdnames.org. The location description defines Breeding Range only. So you can expect birds outside of the location to be listed but you will typically only hear calls not songs from them. See more in Red List, Region, and Location below. You need 'Show Web' to be set true in the 'Options' screen for the Web to work interactively. The 'Web' screen will bring up a web page of the bird last selected or identified or a list of bird web sites. If you select a bird from the 'Songs' list, return to the 'Home' screen and tap 'Web', or if you identify a known or unknown bird and accept the identification, the Wikipedia web site for that bird will come up. 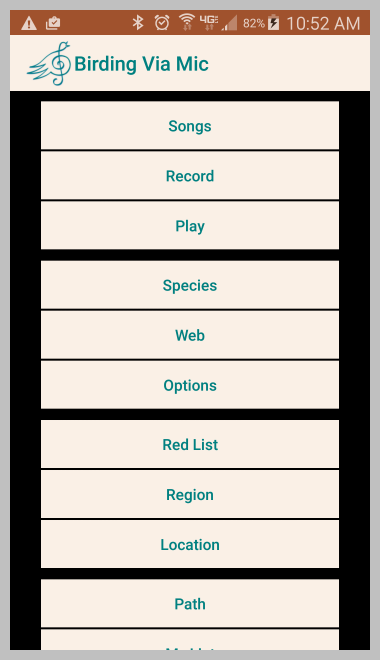 If you select a species from the 'Species' list, return to the 'Home' screen and tap 'Web', the Xeno-Canto web site will come up with a list of recordings for that bird. If the option 'Use Location' is set true, the list will be limited to within one degree of your ocation. On the right side of the screen, you will see 'XC' followed by a number for example, 'XC171727'. Tap on that and a new screen will come up. You can tap on the play icon on the left to hear the recording. To download a recording, zoom in on the right side of the screen. Under 'Audio File Properties' check the 'Sampling rate'. I can only handle 22050, 24000, 44100 and 48000. If it is different from those four rates, you can download and play it but I cannot define it or identify it. (However, see Audacity under Credits.) Under 'Actions' you will see 'Download audio file.' LONG tap on those words and select 'Save link'. You will get a message 'Downloading...' Tap the back key twice to return to the Birding Via Mic app and look for your bird in the Songs list. I will save the full Xeno-Canto description re-ordered with the birds name first. I will also set the species and location. For example, 'XC171727-xc robin.mp3' will be saved as 'American Robin XC171727-xc robin.mp3'. Some android versions save only 'download.bin' not the full description. I save those with the common name first followed by @_Download and the file extension. I change '.bin' to the correct file type for mp3, m4a, ogg, and wav. For those files please change the 'download' to XC... (in the Songs list tap Name) to give the birder credit. If neither a Song nor Species is selected, the automatic processes described above will not be used. Instead a 'WebSites' screen will come up with a list of Bird related web sites. You can 'Delete', 'Name' (rename), or 'Add' sites to this list, or select one in the list and tap 'Go' to visit that web site. 'Auto Filter' -- set true to use an Auto Filter on the Frequency and Noise. Set it false to not use a filter. You don't have to clear this option to false to use the manual filter. If any of the frequency or filter lines have been moved, your manual entry will override the Auto Filter. When set true the 'Songs' List reflects the fifth marker 'a'. 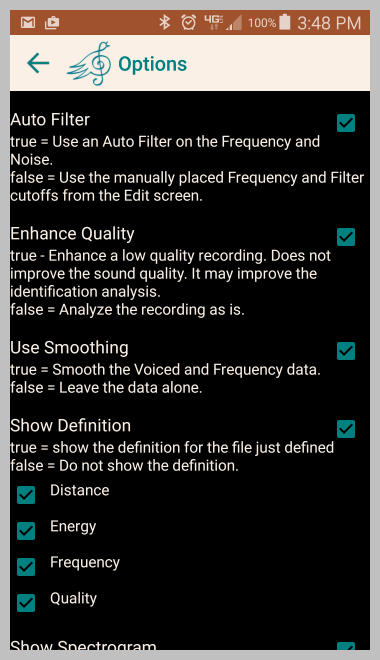 'Enhance Quality' -- Set to true to enhance a low quality recording. This only affects the analysis. It does not improve the sound quality. It may improve the definition and the identification. 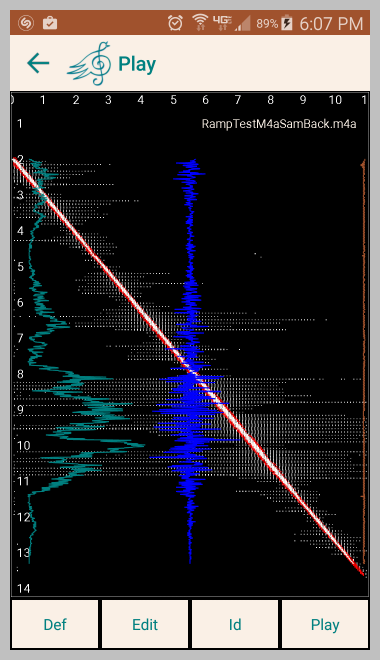 It looks at the signal to noise ratio and builds a unique filter for the song. When set true the 'Songs' List reflects the sixth marker 'e'. 'Use Smoothing' -- Set to true to smooth the Voiced and Frequency data. Set it false to leave the data alone. This is not averaging the frequency but replacing the current frequency with a frequency found at the next lower energy level and more closely aligned with the previous frequency. It can be higher or lower. Voiced is then a function of the previous energy, previous voiced and new energy. When set true the 'Songs' List reflects the seventh marker 's'. 'Show Definition' -- Set to true to show the definition for the file just defined on the 'Play' screen. When cleared to false, it will not show the definition. The definition consists of Distance (teal) not dimensioned -- the term and modified function are borrowed from speech recognition, Energy change (blue) centered is zero and units are not displayed). Frequency (linen), Quality (sienna) is inverted from the top of the screen. Short quality lines are clear sounds. Long lines are syrinx related sounds and the closest two can be harmonic or disonant. The definition data is shown if you are defining or identifying a bird but it is saved only if you are defining the bird. 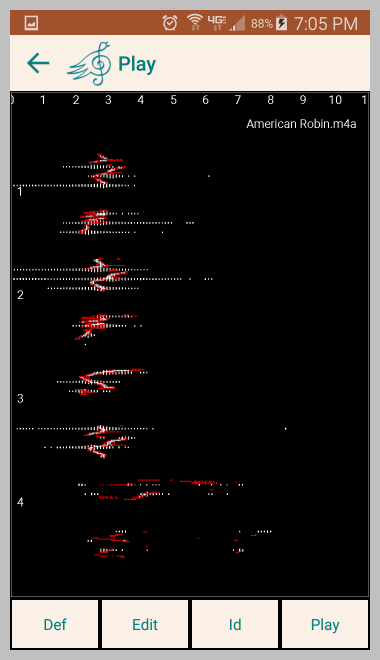 'Show Spectrogram' -- Set true to show the fft spectrogram for the file just defined on the 'Play' screen. When cleared to false, it will not show the spectrogram. And with 'Show Definition' and 'Show Spectrogram' both set true. 'Show Web' -- Set to true to show the bird on Wikipedia for the file just identified, or to select a list of songs from Xeno-Canto for the Species selected, or to select a bird web site. Clear to false to not use the web automatically. This will keep the phone from hanging if you are outside the carriers range. See Web (above) for more detail. 'Sort By Name' -- Set true to sort the Songs and Species by Common Name alphabetically. Clear to false to sort these lists by Genus Species (which is NOT alphabetical and includes Order and Family (not shown) in the sort). The Genus Species sort will put all the ducks together, thrushes together, etc. 'Use Location' -- Set true to use the location to help identification. Clear it to false if you do not want to use the location. In Xeno-Canto it limits song selection to find a bird within 1 degree of your phone. This also affects the Songs and Species lists to be within the bounding ranges defined by BirdLife International. In Xeno-Canto you can see the graphical representation of the BirdLife data. 'Use Audio Recorder' -- Set true to use the Audio Recorder (.wav). Clear it to false to use the Media Recorder (.m4a). I prefer the .m4a. It saves a lot of memory and it seems to do as good a job as the .wav file in recognition. However, if you plan to export and convert the files, use the .wav format. Converting from the .m4a lossy format to another lossy format doubles the loss. 'Sample Rate' -- Set true to record at 44100 samples per second. Clear it to false to record at 22050 samples per second. Shown as the third marker in the Song List and to the right and just below the play button on the record screen. 'Stereo' -- Set true to record two channels. Clear it to false to record one channel. You can see channels in the second marker of the song. The stereo / mono option is here because of the Visualizer View error and I need a workaround. On some phones (or possibly with some carriers) if a song is longer than 40 seconds AND song is mp3 or m4a AND song is mono you can't see the song playing on the play screen. The same song shows if stereo. Currently, the only correct solution is have the vendor and/or carrier recognize the problem and fix it. Note: this is a workaround for the m4a recordings you make if you have the Visualizer View problem. The wav format works in both mono and stereo for all lengths. I can't help you if you download a mp3 file and it is longer than 40 seconds and is mono. (However, see Audacity in credits.) The Define, Edit, and Identify functions still work even if you can't view the song while playing. 'Start Record Screen Showing' -- Set true to start the app with the Record Screen showing. Clear to false to start the app with the Home Screen showing. 'Start Recording' -- Set true to start recording as soon as the Record Screen appears. Clear it to false to wait to record until you tap the Record button. 'Load Definitions' -- set true if you know the songs you want defined and you don't want to listen to them before you define them. Set this option true then go to the 'Songs' screen and select a number of birds that you want to define. When through selecting, tap 'Play' or tap the back key if you need to check any 'Options' first, and then on the 'Home' screen tap 'Play'. The screen will go blank (a few seconds after starting) and remain so until the last song is defined. It will then bring up the 'Songs' screen at the last bird selected. If you clear 'Load Definitions' to false, you can still load the bird's definition. But now you can only define one bird at a time and you will need to play the song first. This gives you a chance to see the definition, edit the file to improve the results, and then re-define it. 'Debug' -- Set true to save debug analysis files. Clear to false to improve throughput. You can limit the Species and Songs to species that are listed within particular IUCN Red List Categories. If the species is not listed in your selected Red List Category, it will not be shown or identified. Tap the 'Update' button to implement your selections. If you update Red List or Region you need to go to Location and update it as well. The concept is: the casual backyard birder can select 'Least Concern' and not be overwhelmed with the list. The dedicated birder can select Vulnerable, Endangered, and/or Critically Endangered if they felt they had recorded a rare or threatened bird. Also select '? : Unknown (Internal)' so your unknown recordings will be shown. Note: Rarity is not necessarily equivalent to extinction risk. Although rarer bird species are likely to be at higher risk of extinction due to their small population size, many species are naturally rare and are not considered to be threatened as there are no threats to them. Although Extinct (and Extinct In the Wild unless the app is used in zoos etc.) will not be used, they are listed so you can check only them and ponder the species list. You can limit the Species and Songs to Specific regions. If the species is not listed in your selected region(s), it will not be identified. Tap the 'Update' button to implement your selections. I recommend: 'Unknown' so you can see the birds you recorded but haven't identified, the 'Region' you live in, and 'Worldwide' for the birds that spill over into your region. If you live close to another region you might want to select it as well. Southern Texas would be wise to include Middle America. Spain would be wise to include Africa. Tap 'Update' when through selecting. If you update Region or Red List you need to go to Location and update it as well. The Regions are: North America(NA) includes the Caribbean; Middle America(MA) Mexico through Panama; South America(SA); Latin America(LA) Middle and South America; Africa(AF) entire continent rather than south of Sahara; Eurasia(EU) Europe, Asia from the Middle East through central Asia north of the Himalayas, Siberia and northern China to Japan; Orient(OR) South Asia from Pakistan to Taiwan, plus southeast Asia, the Philippines and Greater Sundas; Australasia(AU) Wallacea (Indonesian islands east of Wallace's Line), New Guinea and its islands, Australia, New Zealand and its sub-Antarctic islands, the Solomons, New Caledonia and Vanuatu; Southern Cone(So.Cone) includes Argentina and Chile south of the Tropic of Capricorn, also Falkland Islands (defined but not used); Antarctica(AN); Oceans: Atlantic(AO), Pacific(PO), Indian(IO), Tropical(TrO), Temperate(TO), Northern(NO), Southern(SO). Regions of continents or countries by compass (n,e,s,w). See the web site: IOC World Bird List > IOC Lists > Ranges for more detail. To use the phone location you need to set that up on your phone, not in Birding Via Mic. Go to Settings > Location > Mode and tap either High Accuracy or GPS Only. Back in 'Birding Via Mic', when 'Location' is enabled (See 'Options'), this shows your current location (within one degree) which should be enough to identify a general location within 110 km (70 miles). The concept is: if you are in Canada you wouldn't expect to see any Caribbean birds. If you are on the West Coast, no East Coast birds will be listed. If you are 'pretending' to be somewhere else, tap on 'Manual Location' and enter the 'Latitude' and 'Longitude'. You can find these values on your computer at Google Maps: https://www.google.com/maps/. Right-click a location on the map. Select 'What's here?' Coordinates will appear in or below the search box. Google has removed longitude and latitude from Google Maps on your mobile. Location can help or hurt you. When the birds you worked so hard to identify are missing, go to 'Options' and verify 'Use Location' is off, 'Sort By Name' is On, go to Regions and verify that you haven't removed any Region, and go to Red List and verify your designations. 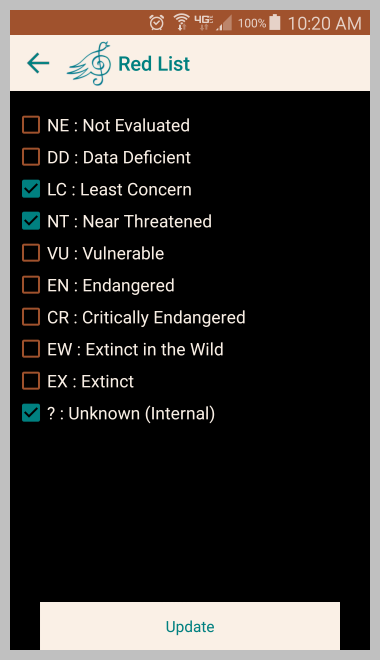 The 'My List' screen shows your personal list of species that have been identified and defined. The number in the parenthesis following the species is the count of files for that species. The menu offers Share so you can email your list. Use this screen for loading several files at once. 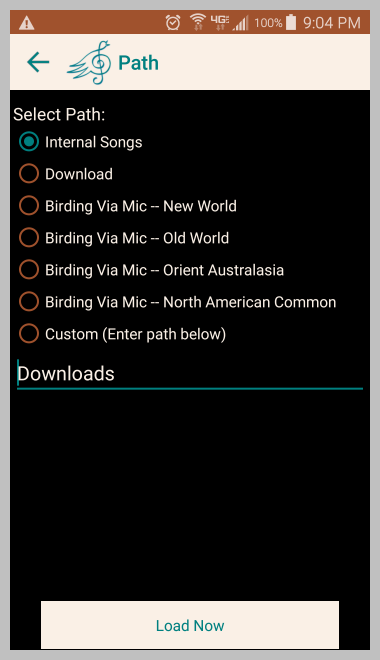 You can choose Download, Birding Via Mic -- New World, Birding Via Mic -- Old World, Birding Via Mic -- Orient Australasia, Birding Via Mic -- North American Common, or enter your own Custom path. 1) Install Birding Via Mic_YourRegion app. 2) Open Birding Via Mic_YourRegion, tap Songs and verify a list of songs is displayed. 3) In this Birding Via Mic app tap the Path button. 4) On the Path screen select Birding Via Mic -- YourRegion. 5) Tap the "Load Now" button. After the load is complete the path is set back to 'Internal'. Uninstall the Birding Via Mic_YourRegion app to recover memory. If you are loading into the generic 'Download' from Xeno-Canto, the files must start with the XCnnnnn number (XC123456), followed by a dash (-), followed by the Common Name of the bird with spaces within the name. Thus 'XC171727-American Robin xc.mp3' will be displayed as 'American Robin xc- XC171727.mp3'. Xeno-Canto does not have a standard for the bird name, so you will typically have to change some of the names. Some birders use abbreviations, others use capitals, others use Genus species, and some use common name. The numbers following the name can be dates and times or sometimes latitude and longitude or song number. Do keep the XCnnnnnn number or rename the file to add it if your android version only saves 'download.bin' and the song is labeled as @_download. The birder who recorded the song deserves the credit! If you are loading from other sources enter a unique 'track' number in front of the Bird Name. Thus an import from The Cornell Lab such as "16 White-crowned Sparrow Song 1.mp3" placed in the download folder will be displayed as "White-crowned Sparrow16Song 1.mp3" after loading. You don't have to use the Path screen to load files. You can gmail a file to your phone. In gmail at the bottom, Long tap the Down Arrow next to the name of the file. The file gets saved in Audio. No message lets you know it got saved. Exit gmail. Apps > My Files > Audio > Hold Down on your file (aka Long Tap) > Menu (upper right) > Move. The words MOVE HERE show up on top. You are now in Device storage. Don't use the back arrow or you will lose those words. Work to Android > data > com.modelsw.birdingviamic > files > Song then tap MOVE HERE. You can export a file using gmail by selecting a song then menu > share. You can also load files from your PC if you have a USB connection. 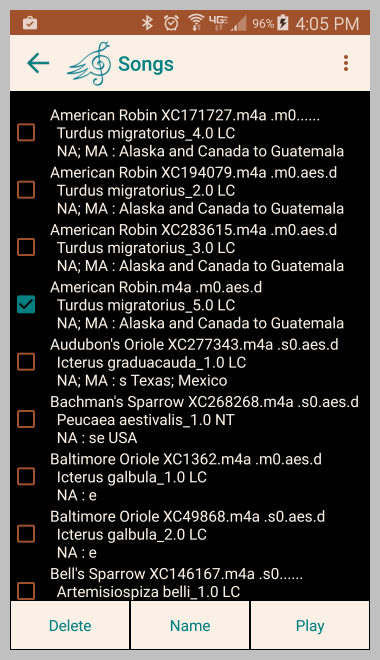 You can store them directly in YourPhoneName > Phone > Android > data > com.modelsw.birdingviamic > files > Song. If the file name starts with the bird's name, I will look up the species when I add the name to the list. As with any file, it should be a unique name or it will overwrite what is there. The Register button brings up a Register screen that asks you to register and shows the data that will be sent: Email Address, Manufacturer, Model, Android Version, Android Release, BirdingViaMic Version, and a Comments area where you can describe any problems you had or are having with installation or running. You can use this same Comments area to send future requests or comments. The Help button brings up what you are reading now. The use of an external mic is optional but recommended. It is very dependent on the Mic options on the Record screen. When plugged in, the phone thinks you have a headset on. If the phone rings, you will hear it. You can talk, but you cannot hear the other party until you unplug the mic. I use a Eudutige I-Microphone EIM-001. It is a high sensitive omni-directional mic. I hope they will produce a uni-directional mic with the same sensitivity and frequency response. If you buy one, order directly from the Eudutige web site -- there are a lot of imitations flooding the market. Be careful and order just the mic not a package of mic combinations. I believe a Blue Tooth mic will not work because it records at 8k samples per second and is thus limited to 4k frequency. I look at these comments, and try to fix any problems. Or run Apps > Play Store > search > Birding Via Mic. BirdLife International and NatureServe (2015) Bird species distribution maps of the world. BirdLife International, Cambridge, UK and NatureServe, Arlington, USA. http://www.birdlife.org/ for allowing me access to their location data. Mark Balman (BirdLife International) for providing the technical details of the BirdLife location data. 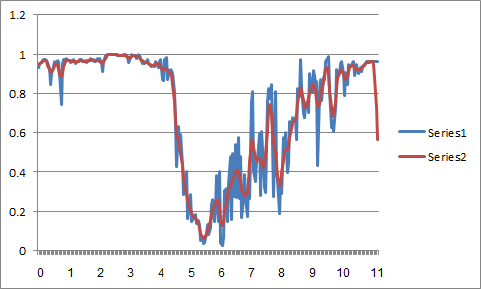 However, I am responsible for the interpretation of this data. Ted Floyd -- North, Middle, Latin America, and Eurasia and for the use of his American Robin in this help screen. Doug Metcalfe for suggesting the concepts of this app. 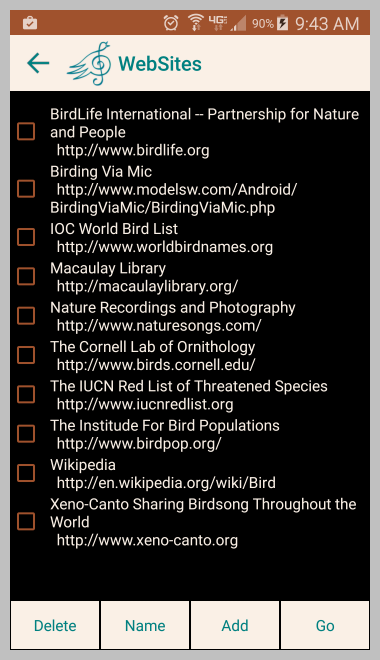 This app would not be functional without Xeno-Canto, Wikipedia Bird, IOC World Bird List, Birdlife International, and IUCN Red List. If you would like to donate, please send your support directly to these organizations. You can find their sites on the Web screen. You can not donate from this app, and I am not a 501(c) organization. Thank you. Enjoy and Best Birding !! First I want to borrow the phrase "A bird in the hand is worth two in the bush" and modify it to read "A bird recorded locally is worth two on the web." Not only the local bird variations but the microphone you use play a large part in identification. The apps listed at the start of this web page will populate your Birding Via Mic app. The songs in the first three apps were selected by the recordists with a request from me: "Please send your favorite recordings". These are great songs, but it will not help toward identifying your local birds. I selected the songs for North American Common which is a start if you live in North America. I welcome "Your Country Common" lists. 1) find a list of common birds in your area. Click on "Retrive Raw Data" > "Enter Retrival System" > "Regional Species Summary"
Choose: Country, Region, Start and End year (use last listed). Copy the list that you develop and sort it in Excel to list the most common birds on top down to the rare birds. 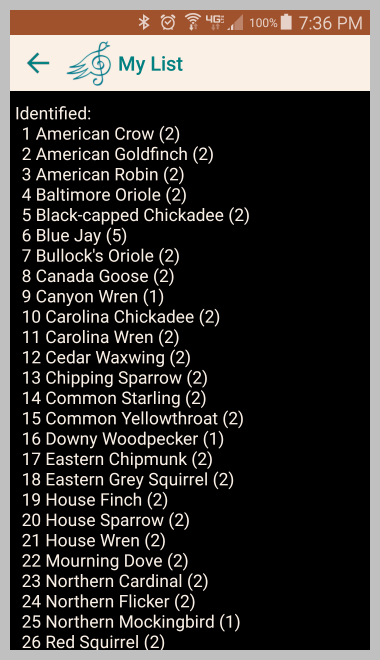 2) Define those most common birds in the app. 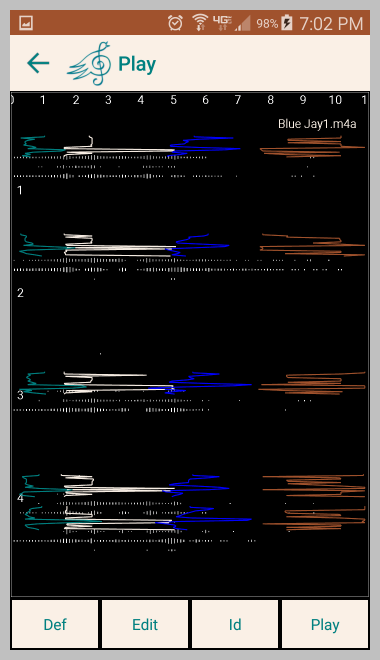 3) Select 3 to 6 Xeno-Canto files for each bird. (A song and a call as a minimum.) Start with Species Common Name q:A, loc:Your Location, check each file in the list and try to find those that have no background birds. If you can't find files that qualify in your location, drop the loc:qualifier and look at the expanded list starting as close to your location as you can. 4a) If you are working directly from the app, follow the instructions under Web using Species to load the selected files. It will reflect the species when loaded. 4b) If you are using a PC, a sound system and a mic on your phone. Use the Option Audio Recorder false and Sample Rate false to save space. Experiment with the options on the record screen. Play the Xeno-Canto song on the PC and record it in the app. It will not know the species. You will need to Name it and select the species if it can't identify the bird. 5) After loading (or recording) each file, Play and then Define it. After loading 2 or 3 songs run Identify before Defining it and see if it recognizes the bird. If it does then go to next bird else Define it and load another file for the same bird. Here are three Signal to Noise lowpass filters generated when the enhanced option is set true. 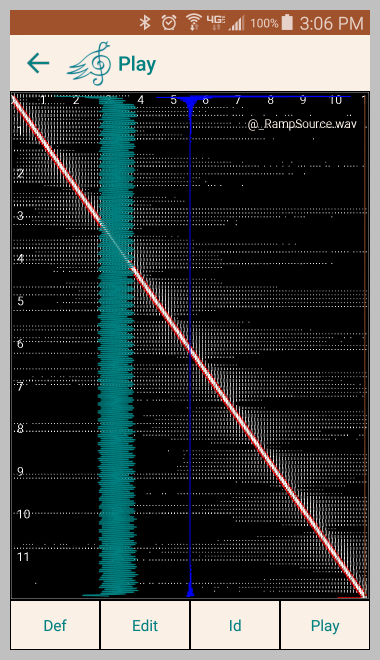 If enhanced is false there would be a straight line across at y = 1.0 for the entire frequecy band (x) from 0 to 11025 hz showing all frequencies would be passed. Series 1 is the signal to noise ratio. Series 2 is the filter kernal in the frequency domain which is applied to the signal. The first two images are of the same bird with different microphones. The third image is a different bird with the microphone used in the second image. 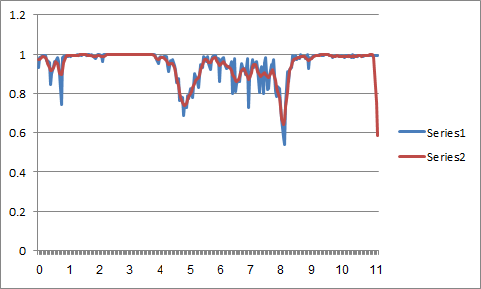 The drop in the filter kernel at the end is a signature of a lowpass filter. This is a Ramp Generated from 0 to 11025 Hz at 22050 samples per second. This is a recording of the above source with a Motorola Razr using .wav format (left) and .m4a format (right). The recording is with the audio source the same orientation as the camera if available, else the main device microphone. This is a recording of the above source with a Samsung S5 using .wav format (left) and .m4a format (right). Using the same mic orientation as the camera. I recognize this does not make sense because the mics are on the bottom and top and the cameras are on the front and back. This is a series of events: First the Blue Jay song is Identified with the options Auto Filter, Enhanced Quality, and Show Definition on. Then with Edit, the Start and Stop lines are dragged to include the last five phrases and Save is tapped. 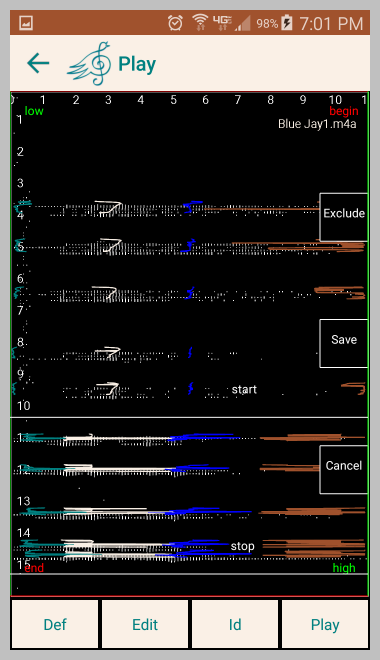 The new file is then identifed with the same options as above and then a second time with the option Show Spectrogram on. This brings out the harmonics that make this call quite unique. Recorded with a Motorola Droid Razr. Source from Western Bird Songs CD disk 2 Peterson Field Guides. Houghton Mifflin. Played through a Yamaha Powered Monitor speaker. ACCESS_COARSE_LOCATION is network based location access meaning the location is by your network, it could work within buildings or underground trains as long as you have access to your network. ACCESS_FINE_LOCATION is using gps thus your phone needs to be united with the sky. You could be out in the woods and not have access to the network, but your phone can "hear" the Global Positioning System (GPS). One or the other Access Locations (COARSE or FINE) is needed if you select "Use Location" to limit the number of birds during identification or to find birds recorded on Xeno-Canto that are close to you. The location saved and used is within one degree or 110 km (70 miles). 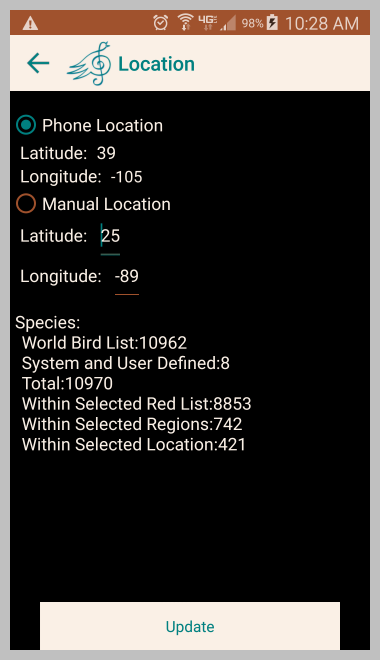 You can manually enter a location (Latitude, Longitude) if you wish to view the birds in a region you are not physically located at. The use of COARSE and FINE LOCATIONs are the criteria that limit the app to "Low Maturity" rather than "Everyone". INTERNET is needed to display the birds identified or download bird songs. 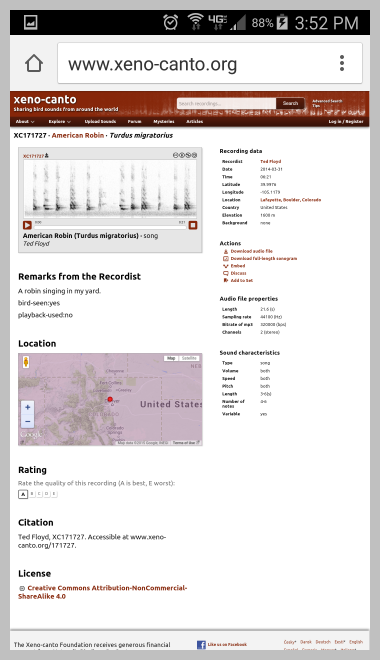 RECORD_AUDIO is needed for you to be able to record the birds and thus be able to recognize them. You can choose between .m4a (lossy) or .wav (lossless). READ_EXTERNAL_STORAGE is needed to read the Download folder. WRITE_EXTERNAL_STORAGE is needed to save a file in the Download folder. These two permissions (READ and WRITE) plus INTERNET are needed to select, download, and import songs to the app. WAKE_LOCK is required to keep the CPU alive while downloading files (NOT to keep the screen awake). ACCESS_NETWORK_STATE is required to poll the state of the network connection and respond to changes. ACCESS_WIFI_STATE is required to check whether Wi-Fi is enabled.